Last fall, I was invited to speak at the 2010 High Energy Astrophysics Division meeting about some of the work I’ve been doing with ultraviolet observations (which is apparently low-energy astrophysics). I accepted the invitation–and I want to emphasize this point–only later discovered that the meeting was in Hawai’i. Lucky me! I flew in on a ridiculously early flight from Denver arriving in Kona (west side of the island) in the early afternoon. A half hour of very educational shuttle ride brought me to the Hilton Waikoloa Village, a resort/conference center which boggles the imagination. For instance, to get from one building to another, you have your choice of monorail, canal boat, or a walk through the impressive Asian art museum. Or you can take the long way around through the flamingo preserve, take the bridges over the lagoon (look for sea turtles) and past the waterfront (watch for whales out at sea). Feel free to enjoy the breakfast buffet ($26) or take an opportunity to swim with their captive dolphins ($260). Wow! The lagoon at the Hilton Waikoloa Village. This was my first time in Hawai’i and I felt it was my moral imperative to take advantage of any and all cultural enrichment opportunities. The meeting was Sunday night through Thursday, but I skipped out on Thursday morning to do a bit of touring. Tuesday: Being without-car at the resort, I was limited to what could be seen on foot, so about a six-mile radius. Fortunately, there is the Ala Loa or King’s Trail nearby which was both interesting and convenient for exploration. Ala Loa is a 32 mile horse path made in the 1800s between Kailua (near Kona) and Puako at the northern end of the Kohala resorts. It’s straight as an arrow and cuts directly across the lava fields. After 48 hours of “paradise” it was nice to see what the island looked like before the advent of golf courses and $200/night hotel rooms (really). The dividing line between natural and unnatural is obvious. The Ala Loa runs straight-as-an-arrow through brutal fields of a’a. What it looks like is complete brutality! Ala Loa is smoother than the surrounding fields of shattered A’a, but it’s still cut-you-to-ribbons nasty stuff that clinks underfoot like running on shattered cinder block rubble. Looking up-slope, you can follow the black lava flows all the way up to the huge bulk of Mauna Loa many miles away (weather permitting). I ran a couple miles of this in the hot sun north to the Puako area, then gratefully made my way through the trees past ancient fishing ponds to the waterfront. The beaches in this region are some of the best in the world, and each resort has staked out it’s picturesque bay. But public access is taken seriously on this island and there are nice trails by which I could run in one side and out the other of each place. At length, I reached the trail to the Puako Petroglyph Field and ran three quarters of a mile through scrubby forest. The petroglyphs are clustered in a basketball-court-sized field of old, brown lava. They’re mostly stick-figure humans with a few odd exceptions, and they’re mostly facing the mountain. It was pretty interesting stuff and I was impressed at how un-marred it was by more recent additions. Loni would like to welcome you to Pu’uhonau O Honaunau. Thursday: My first stop on the drive south from the resort was at Pu’uhonau O Honaunau (aka Place of Refuge), a new National Historical Park south of Captain Cook. A startling number of minor things were kapu under ancient Hawai’ian law, i.e. illegal and punishable by being clubbed to death by the King’s soldiers. This included such things as men and women eating together, letting your shadow cross that of the king, and presumably wearing white after Labor Day. However, if you could make it to one of a dozen or so Places of Refuge around the islands, you could undergo several days of religious purification and emerge a free man, all your sins nicely nullified.The National Historic Park is small and easily seen in an hour, but very nicely done and completely fascinating. I don’t generally have much use for ranger-lead tour groups, but the colorful old Hawai’ian gentleman leading the tour gave just the right mix of stories, history, and standup comedy. Really interesting stuff and a very peaceful place as well. It was nice to mix in a little culture with my ecotourism. The southernmost crazy people in the USA. Thursday: The drive around the south end of the island is long and doesn’t have a whole lot of major tourist attractions along the way. On a whim, I followed the signs to South Point down ten miles of marginally-paved one-and-a-half-lane road to the southernmost point in the United States… and it was surprisingly interesting!First of all, it’s incredibly windy here and the ocean is whipped up into frothy whitecaps that are anything but Pacific. After running out to the actual southernmost point and back (hold onto your hats! ), I spent a while on the sea cliffs near the parking area. The cliffs are about 30′ tall and are in the somewhat sheltered area of the water. The water below is on the order of one hundred feet deep and you can tell this because it’s absolutely crystal clear all the way to the bottom. 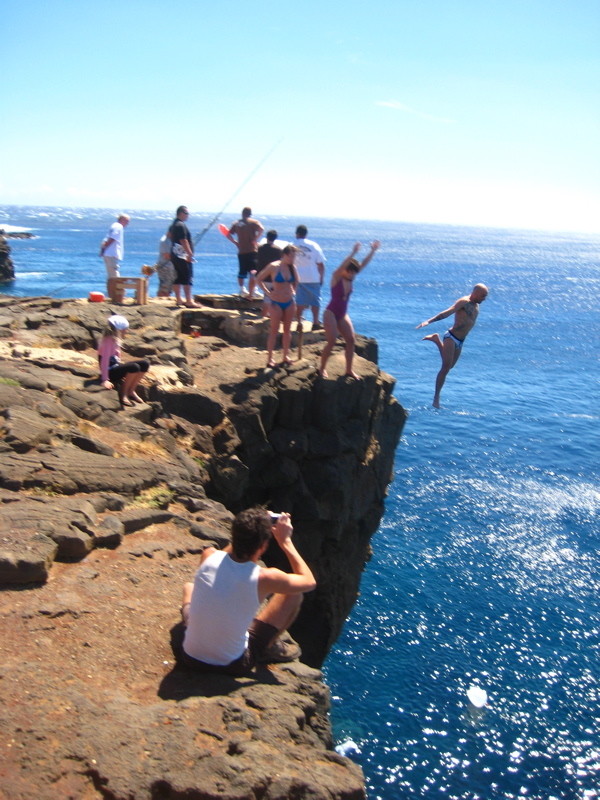 South Point is popular with both fishermen and cliff divers and it was quite a festive, windy scene. The fishermen tie inflated garbage bags to their lines and fly them far, far out to sea like kites. A number of garbage bags could be seen perhaps half a mile out bobbing on the impressive waves. The divers stand poised at the cliff edge waiting for the right wind conditions before taking the leap. There is a rather sketchy-looking ladder to climb back out or you can swim around to the south and “wait for a wave to wash you up on that ledge, then just scramble back up”. Though they encouraged me to join them, this is an extreme sport I am more than happy to just watch. My two big priorities for this trip were to see the volcanoes on the east side of the island and the lush vallies on the north coast. Much as I love Colorado, we don’t have either of those here. After leaving the conference on Thursday, I managed to drive all the way over to the east side of the island and made it to Hawai’i Volcanoes National Park with a couple hours of daylight to work with. As with most National Parks, there is a scenic drive with various pull-outs which, along with the visitor center, occupies 90% of the tourists. 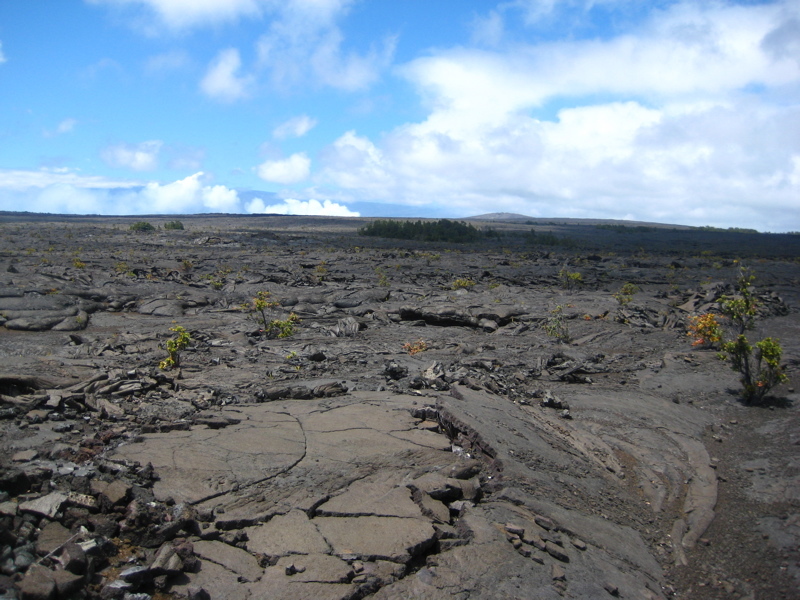 The first such pull-out was for Kilauea Iki, a “small” crater to the east of the huge plain of gray lava that marks the main Kilauea caldera. It was raining lightly and foggy, but I had spent a long time in the car and was eager to explore. 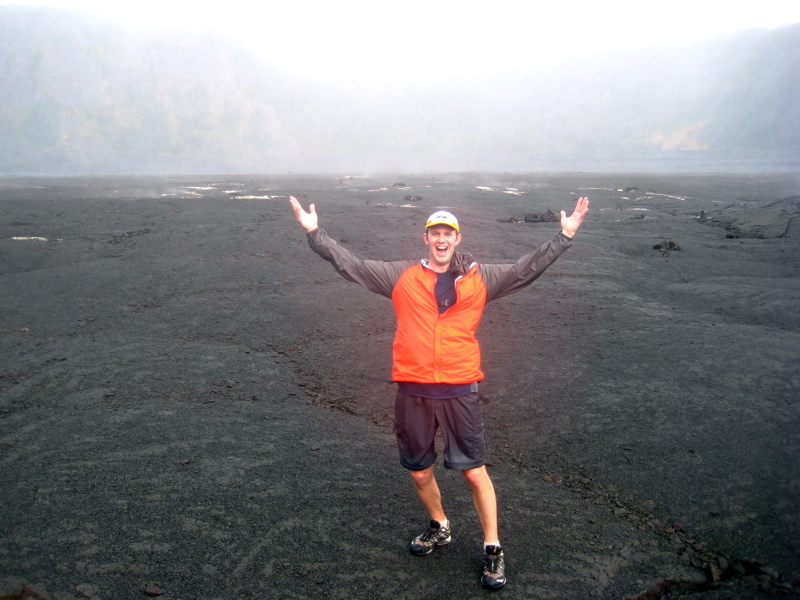 I threw together some gear and set off for a five mile jaunt through the crater and back. Kilauea Iki from the trailhead. The trail follows the right rim, then comes back across the middle. The first mile was along a beautiful trail on the north rim of Iki, through rainforest with occasional precipitous viewpoints down into the crater. 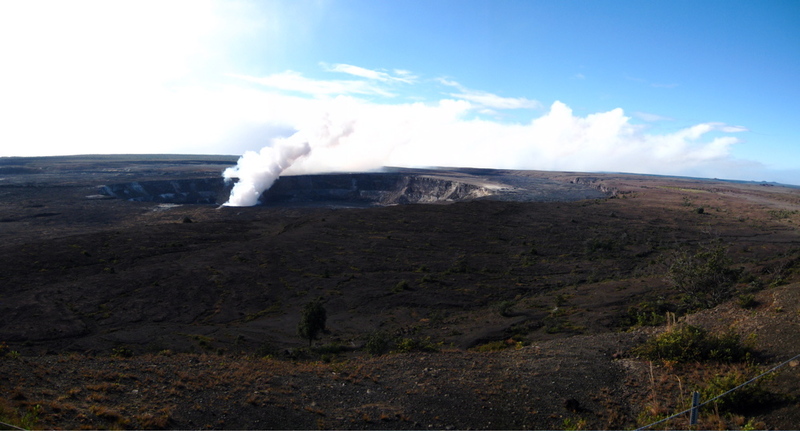 Small though it may be, Kilauea Iki is still a mile across and probably 500′ feet deep. Iki last erupted in 1959 in an event that shot plumes of magma 1900′ into the sky and filled the crater with a deep lake of lava. The lake filled and emptied several times in rapid succession leaving a bathtub ring of dried lava on the rim and a smooth, gray floor. Fifty years later, it’s still hot down there and there are numerous steam vents in the cracked crust. Running across the Big Brownie. Rounding the western end of the crater, I dropped steadily through the dripping forest and ended up on the bare, black lava. The trail was marked with rock cairns, and ran straight as an arrow across the center of the crater. The surface was smooth on the large scale with low humps several yards across, but there was a dry flakiness to it and thin shells of rock would crackle under my feet whenever I veered off the main, well-trodden path. It was like walking on a giant brownie. Here and there, steam issued from cracks in the surface and a few hearty plants were starting to gain a root-hold. This was a completely novel environment for me and I marvelled at what young earth looked like. The transition from crater floor back to the rainforest of the edge was startling and abrupt. On Friday morning, I returned to the Park for the main event: a long run through the Napau Wilderness along the Chain of Craters. The Chain of Craters is a string of recent activity along a rift zone stretching south and east of the main Kilauea vent. In 1969-1974, the chain of craters itself (along with the road the wound among them) was largely inundated by the eruption of a new vent which, in due course, produced Mauna Ulu (“Growing Mountain”). The road has since been relocated, but a trail now follows the Chain of Craters and that seemed good enough for me. The smaller crater within the huge Kilauea Caldera. For scale, the steam plume is about 400′ across at the base. Breathtaking! After some initial auto-tourism, I arrived at the Mauna Ulu trailhead. 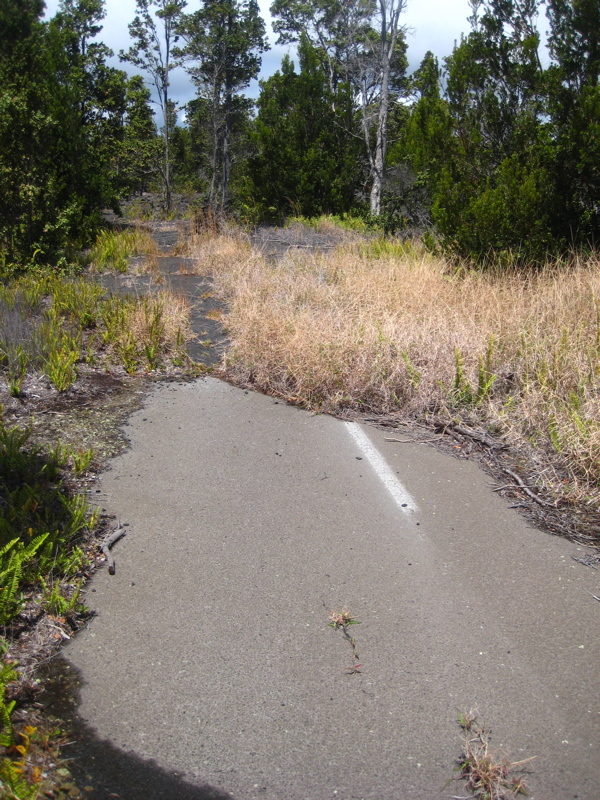 The first mile of the trail is well-marked and well-trodden through lava fields and patches of forest. The lava trees are especially interesting. At 1.5 miles, I took a spur trail to Pu’u Huluhulu, a 500-year-old cinder cone from a previous period of eruptions, now filled with a dizzying array of native plants. 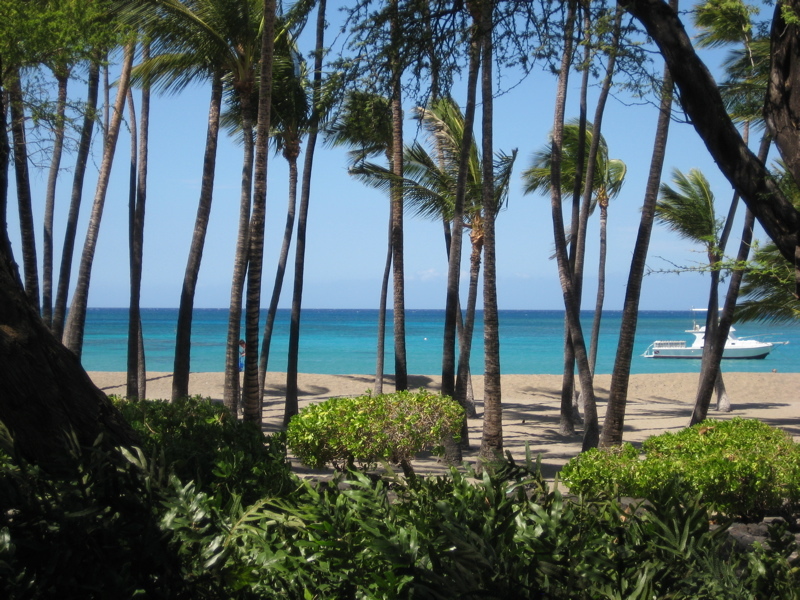 There’s also a good view of Mauna Ulu just across the way. From the viewpoint, I could see three people hiking off-trail to the summit. Mauna Ulu from the summit of Pu’u Huluhulu. Notice the lava lake in the foreground. This is the kind of thing I would never do by myself (probably), but the thought of other people up there gave me a bit more courage. As with alpine terrain, distances across lava are hard to judge since you have no scale references. While it looks huge, Mauna Ulu is actually quite small and I quickly made it to the rim of the still-steaming caldera… or at least as close to the rim as I dared to tread! This mountain is the same age as me and the caldera is a gaping wound a few hundred feet across. Large cracks around the edge show that pieces have been falling for some time now and that the process isn’t over yet! I peared into the crater but couldn’t see the bottom without standing closer to the edge than I was quite comfortable doing. Amazing! Surely this is what Dante had in mind when he described the entrance to Hell. This is as close to the rim as I was willing to get. Fantastic drippy lava formations along an outflow channel. From the summit, I headed east down the slope to catch the trail as it cut across the lava plain. I followed the right hand side of a deep lava channel going by dead-reckoning. This is definitely virgin terrain here and thin lava crust kept breaking underfoot leading me to wonder what manner of hollow cavities and pools of magma might lie beneath. After about half a mile, I saw reason and decided to backtrack back to the trail the way I’d come up. Running on this stuff is not easy! Back on the officially sanctioned trail, I set out toward Napau Crater another 5 miles away. The rain of earlier in the day had given way to bright sun which made everything in this shadeless realm hot and arid. The string of cairns lead inexorably to the east and I ran/walked doggedly along. This stuff wasn’t quite as bad as the Ala Loa a’a but my shoes were still taking a real beating. I wondered what it would be like if I tripped and fell on this stuff. Certainly not pretty! At length, I reached the large Makaopuhi Crater (Eye of the Eel) and stopped for a quick lunch. Forest on the other side spoke of welcome relief from the sun and jagged terrain. I was definitely not looking forward to running back across the four miles of hot ground. After half a mile of blissful forest running along the edge of Makaopuhi, I reached a trail junction for the Naulu Trail which lead 3 miles south to a different trailhead. On the principle of seeing something new, I headed south along gorgeous, jungly trail which is clearly not one of the more popular in the Park. The jungle gave way to lava flows again and the trail was very difficult to follow. I spent quite a while standing at one cairn scanning the horizon for the next. It took me an embarrassingly long time to figure out what all this smooth, gray lava was. After a half dozen miles across the lava, I was starting to recognize different variations of the two main types: a’a (the jagged, rubbly type) and pahoehoe (the smooth, ropey kind). Along the edges of the forest, I started to notice occasional patches of something new–completely flat, smooth, gray lava interspersed with the more typical pahoehoe. I must have traversed a mile of the stuff off and on before I found a patch with a faded while line painted down the middle. Ah! Half a dozen miles into such an unearthly wilderness, I’d found the remains of the pre-1969 Chain of Craters Road! The cognitive dissonance was unreal. Tired, hot, and clearly more than a little delirious, I finally arrived at the new Chain of Craters Road at a nice lookout over the sea. From here, it was obvious how much lava has flowed over the years and how far it ventured from the active vent over a dozen miles down hill before hitting the ocean. It was hot and I wasn’t looking forward to another handful of miles along the road. Fortunately, I was picked up by the first car that came along (a nice couple from South Carolina) and they drove me back to the Mauna Ulu Trailhead. This view of Waipi’o Valley is free. Anything closer and you’re going to have to work for it. The Volcano was great, but my numero uno goal for the trip was to explore the lush Waipi’o Valley on the northern coast of the island. You may never have heard of it, but I guarantee you’ve seen it in pictures and movies. It’s a deep cleft in the rainy Kohala Peninsula fraught with jungle and waterfalls and taro farmers which has changed as little as is possible over the generations. 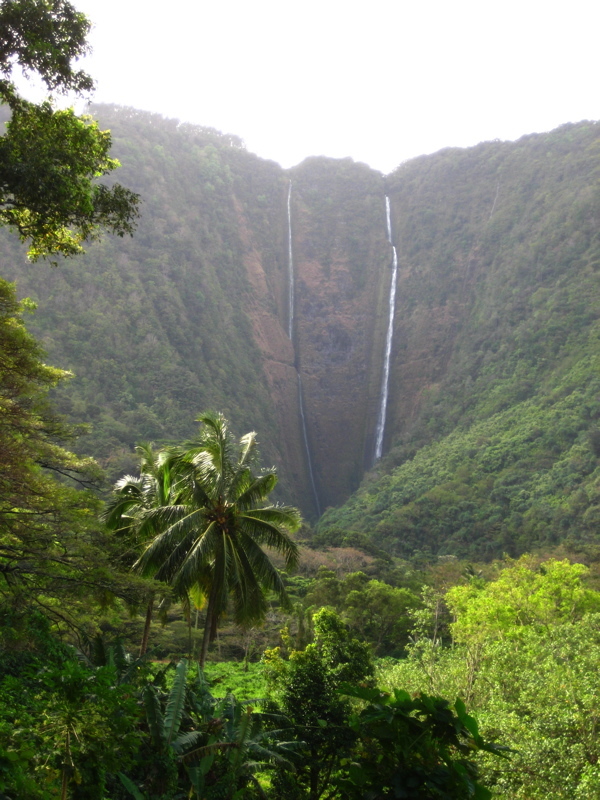 The twin Hi’ilawe (right) and Hakalaoa (left) Falls. I arrived at the spectacular Waipi’o Overlook and prepared for another strenuous run down into the valley and perhaps up the other side when my plans took an unexpected but welcome turn. At the conference, I’d met Jake and Miriam, a young couple on their honeymoon, and compared notes. As I prepared for my run, Jake and Miriam pulled up next to me and we agreed to combine forces. As more milling commenced, we were joined by Sarah and Susan, a pair of German sisters on holiday. The five of us set out before we attracted too many other tourists and became a mob. One can, in theory, drive down into the valley. There is a road and it is paved. However, it’s one of those roads that is paved because it’s too steep not to be. In one mile, it drops 900′ at a grade of up to 25%. Even walking down this thing was a little exciting. Needless to say, my rental car would not have enjoyed the process. At the bottom of the road, we were presented with a choice: turn right to the beautiful black sand beach, or left to explore further up the valley including several notable waterfalls. We chose left and hiked down a sleepy road through a small community. Rounding a corner, we spied the end of a side valley where a pair of astonishingly tall waterfalls plunged down the vertical green wall. These were Hi’ilawe and Hakalaoa Falls. This was another situation where, were I alone, there’s no way I would have attempted what happened next. But we had strength in numbers, maps, guide books, and a vaguely-defined sense of manifest destiny, so we set off down a faint trail to try to get up close and personal with a pair of 1400′ tall waterfalls. After a few hundred yards of hiking, the Germans decided it was more than they wanted to deal with and turned back. However Mike and Josh, a strapping young pair, appeared behind us and joined forces. Mike lives in Hawai’i and had been to the falls once before, so we appreciated his local expertise. Miriam and I cross the deepest part of the river. Gnarly spiders like this were all over the place. The first noteworthy part (other than the numerous spider webs across the trail) was encountered at a small dam. The path continued on the other side, but we had to wade through to get there. Cameras went into dry bags, packs went on heads, and we proceeded across. The water was pretty cold and armpit-deep on me, the tallest of our party. Miriam, who is tiny, had to swim it. Things got easier once we got to the other side but we were still in the water about 30% of the time on one side of the river or the other, scrambling over slippery rocks, hacking through spider webs, and finding our way up and down muddy slopes. Finally, the base of Hi’ilawe Falls! 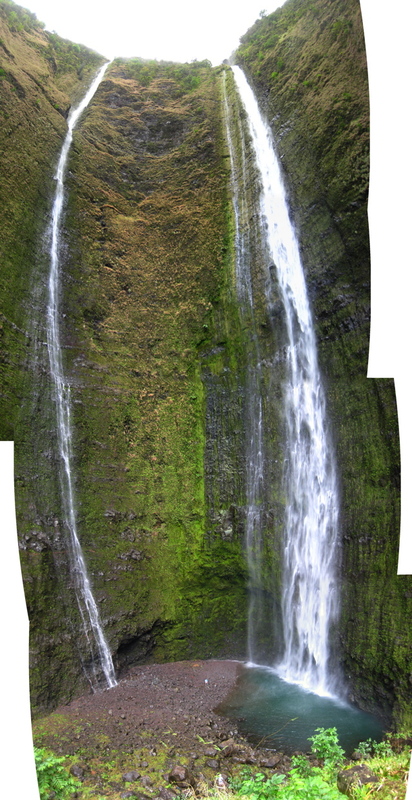 After two hours of bushwhacking covering something less than a mile, we waded up a knee-deep stream and encountered the base of Hi’ilawe Falls. It’s hard to describe what it’s like to stand at the base of a quarter mile of vertical water: rainy, windy, loud, and humbling would all be good adjectives. From directly below, it was nearly impossible to judge how tall it is, but I am told that the main falls is 1200′ with a series of shorter drops immediately above. The cliff was soaked in moisture and very green and I had a perverse fantasy of trying to climb it. But a large number of rocks of all sizes lay at the base of the falls speaking to the quantity of erosion that must happen here. A quarter mile of vertical water. Note Jake standing down at the base. Photos completely fail to do the place justice, but we tried anyway, boy did we ever try! Josh swam in the pool at the bottom and reported that it was brisk and that the water drops from above stung like hailstones when they hit. I climbed a small hill in the center of the cirque and the falls still towered above; the only difference was you could see how tiny the people at the base were. We spent an hour at the falls, wandering around with slack jaws and stiff necks before turning and retracing our amphibious steps back down the valley. It was faster on the way out since we knew the route (more-or-less), but it was still over four hours of expedition. When we finally set foot back on the road, it was strange to have the path before us so wide, flat, obvious, and dry. The day was getting on and we were all pretty whipped, but we hiked down to the beach anyway, arriving just in time for a pretty impressive wind and rainstorm. Fortunately, we caught a very exciting ride in the back of a pickup truck and were quickly whisked back up the road to sunshine, dry shoes, food, and most of the comforts of home. Wow, what a day! I look forward to coming back on fresh legs to explore the rest of the valley. Camping was unfortunately the low point of the trip. To balance out the obscene extravagance of the Hilton and restore the karmic balance to the world, I planned to spend three nights camping on the beach afterwards between my diurnal adventures. This was fine in theory: I registered for county campsites on their very nice web site, acquired permits, and so forth. But gear turned out to be my downfall. I’d brought a very light sleeping bag and tarp and pretty much nothing else. Even in a tropical climate, this isn’t sufficient to fend off the wind, rain, and giant centipedes. My first night (Thursday) was spent at Punalu’u, a black sand beach on the SE coast between South Point and Kilauea. It was a beautiful place and I met some really interesting folks there: drifter Grant who first-thing offered me a freshly-picked coconut and instruction on it’s disassembly; quiet-talking Heather; and Lou and Ingrid, a kindred-spirt older couple from Minnesota who introduced me to the proper Hawai’ian breakfast (fresh passionfruit scooped out into half a papaya, serious yum!). But it was incredibly windy all night and around midnight, a large group of local youth arrived to fish and play loud music. Night two (Friday) was at the interesting and wild Laupahoehoe Point on the NE coast. It’s an interesting place; the only level area near the sea on the Hamakua Coast and the site of a school destroyed during the 1946 tsunami. Even in non-tsunami conditions, the waves hammer the coast in an impressive way. It’s a really nice park with a couple of pavilions and some nice campsites. Unfortunately, it was also rainy and windy and there were no less than two large, loud parties going on until the wee hours (country or techno, your choice). After a couple attempts at tarp deployment, I gave up and slept in the back of my Chevy Cobalt (not bad, actually) disconcertingly close to the crashing surf. Spectacular sunrise from Punalu’u beach. A turbulent morning at Laupahoehoe Point. 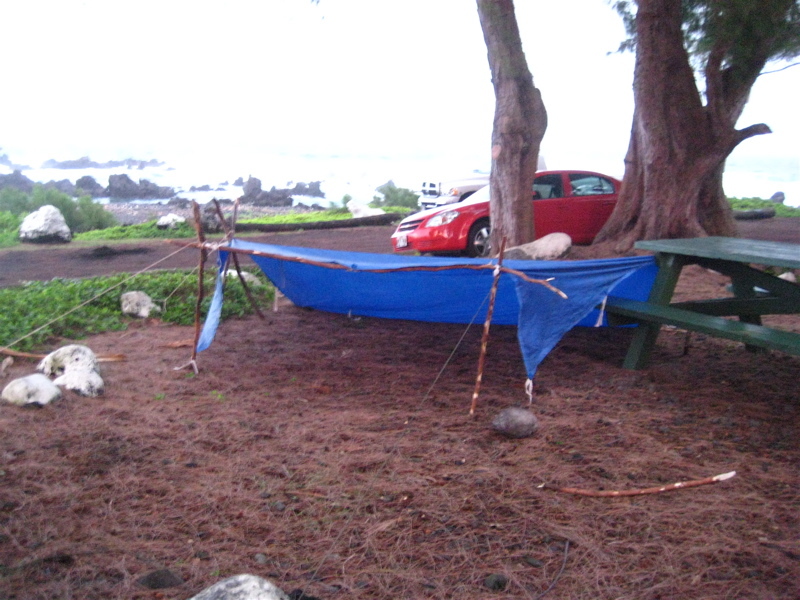 Saturday night was to have been at Kapa’a Beach Park on the western Kohala coast, but I was soaked, tired, and not willing to endure a third night of raucous campground life. Instead, I admitted defeat and found the cheapest available lodgings in Kona. Next time, I will bring an actual tent, a ground sheet, and avoid weekends at the county parks. Another thing we don’t have in Colorado is coral reefs and colorful fish (except in aquaria) and this turned into the unexpected high-point of the trip. The lagoon at the resort rented snorkel gear for $7/hour which, considering the price of everything else at the resort, seemed pretty reasonable. My first snorkeling foray was pretty neat with various fish and a trio of large green sea turtles (Honu) which I learned only later are endangered and you’re not supposed to approach. Buoyed by my success at the resort, I hiked a mile down the coast to Anaehoomalu Beach (aka A Beach) where a similar equipment shack rented me gear for the same rate. This beach is one of the better ones in the state and featured actual clear water with alternating sandy patches and towers of coral. What a world of difference from the lagoon at the hotel! In the first five minutes, I saw an octopus, a large moray eel, and countless fish I’d only previously seen behind thick panes of glass. They may be endangered, but I saw no shortage of Honu (Hawaiian Green Turtles). A pencil urchin as seen through my face mask. My third, final, and by far most successful snorkeling expedition was on my last day on the island. I discovered Snorkel Bob’s in Kona which will rent you a snorkelling rig for (including theft insurance) $2.90/day. They also gave me a fish identifying chart and directions to all the good snorkeling areas in the vicinity. Weekly rentals aren’t much more than what I paid for an hour at the resorts. If only I’d found them on my first day on the island rather than my last! 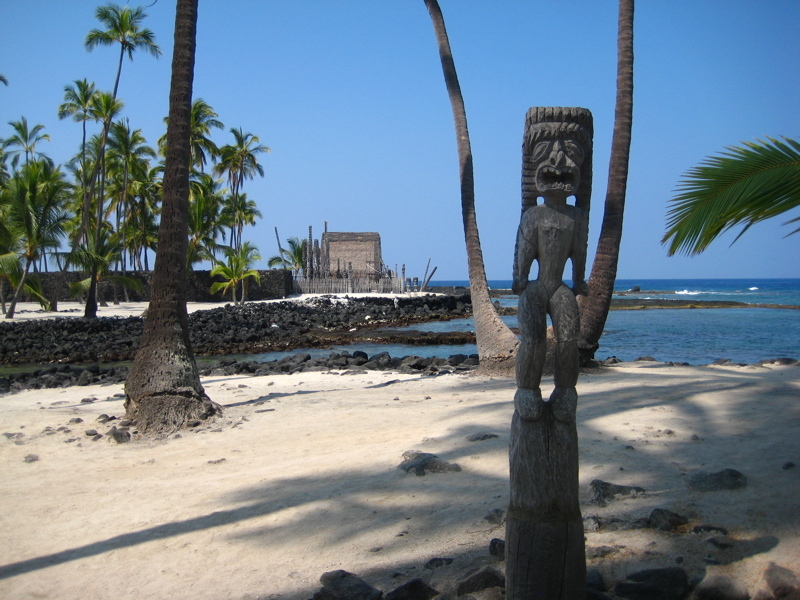 The beach they sent me to was Kahulu’u about five miles south of Kona. It’s uber-popular with snorkelers and it’s easy to see why. While it’s not much of a beach, an ancient breakwater shelters the bay from the crashing surf and it’s basically one huge reef. Most of the snorkelers don’t get too far from land, but the water was calm and surpassingly clear, so I swam out to the deeper area where the surfers were hanging out (mostly complaining “you know the surfing’s bad when the snorkels get out here!”). It was really nice to not keep watching the clock. I spent probably four hours in the water following fish around, zooming through corral, and watching (from a safe distance) the turtles feeding on algae. I’m generally pretty bad at just sitting back and relaxing, but this finally did it for me. It was a real high note to leave the island on. It was truly a great trip. Despite three solid days of touring, there’s plenty left for a second trip and I can’t wait to return. The people, both tourists and locals, were almost universally great folks. Jake, Miriam, Sarah, Susan, Mike, and Josh were great partners in adventure. Many thanks to Josh, Sam, Eric, Cyndi, Kevin, and all the others who gave me advice on what to see and do on the Big Island. 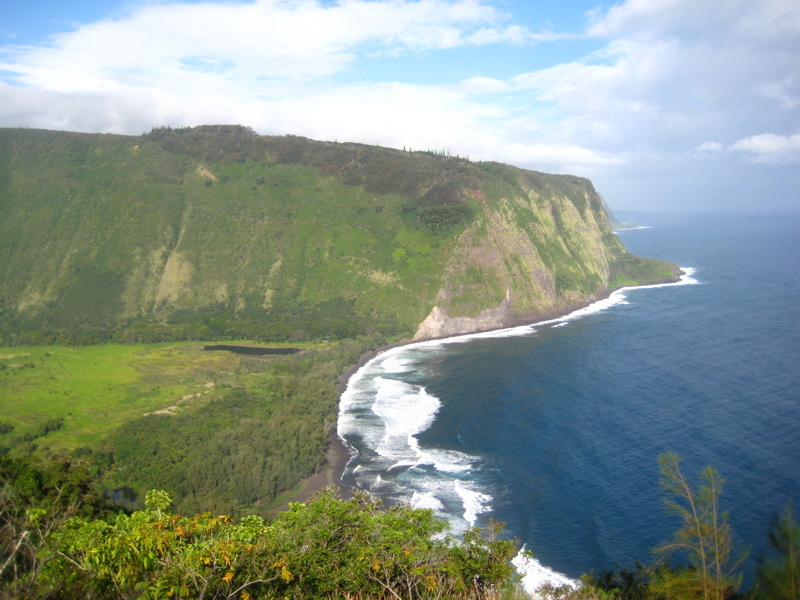 This entry was posted in abroad, classics, exploration, peak, running, solo, travel and tagged big island, hawaii, hilo, kona, south point, vocanoes national park, waipio valley, waterfalls. Bookmark the permalink.